Serie A, which was established in its current format in 1929, is the highest level of the professional game in Italy. The country’s first football competition was organised in 1898 and took place on a single day in May of that year, with Genoa defeating Internazionale Torino in the final. The championship evolved over the next two decades until it was decided in the late 1920s that a round-robin, fully national tournament was the way to go. Inter – then known as Ambrosiana – were the first victors, edging out Genoa and Juventus to finish in top spot after 34 games, with all 18 teams playing each other home and away. The size of the league has changed over the years: 18 clubs shrank to 16 between 1934 and 1942, then rose to 20 after the war and 21 for a single season in 1947/48. It was back at 20 for the four years after that, before dropping to 18 between 1952 and 1967 and 16 between 1967 and 1988. It was then back to 18 until 2004, when the division decided to once again house 20 outfits like it does today. The Italian league has always been regarded as one of the strongest in the world, a point backed up by the fact that no country has provided more European Cup finalists (27). Juventus are the most successful club in Italian football history, with 32 Serie A titles to their name (they have technically won 34 on the pitch, but two were revoked in 2005 and 2006 when the Bianconeri were found guilty of unsportsmanlike conduct after a number of Serie A teams were accused of influencing the selection of referees and trying to fix matches). If Max Allegri’s side finish in first place in the current campaign, they will set a new record of six championship crowns in a row, overtaking the legendary Torino outfit who triumphed for five seasons on the bounce between 1943 and 1949 (the league was cancelled for two years during that period due to the Second World War). Many fans of the Italian game believe il Grande Torino, who tragically passed away in a plane crash, are the greatest team to ever grace Serie A. Other contenders include the Juventus of Antonio Conte and Allegri that have dominated this decade; Arrigo Sacchi’s Milan, who were only crowned Italian champions once but won the European Cup on two occasions; the Inter side who claimed five titles under Roberto Mancini and Jose Mourinho between 2006 and 2010, as well as Helenio Herrera’s Nerazzurri in the 1960s; Juventus in the early 1930s, who won the league three seasons in a row; and the Napoli team that Diego Maradona inspired to two scudetti in 1987 and 1990. The complete breakdown of titles won is as follows: Juventus 32, Inter 18, Milan 18, Genoa 9, Torino 7, Bologna 7, Pro Vercelli 7, Roma 3, Lazio 2, Napoli 2, Fiorentina 2, Sampdoria 1, Verona 1, Cagliari 1, Novese 1 and Casale 1. In total, 66 different clubs have competed in Serie A. The Italian top tier has provided a home to plenty of first-class footballers over the years; indeed, no fewer than eight players have won the FIFA World Player of the Year award while plying their trade in Serie A: Inter’s Lothar Matthaus (1991), Milan’s Marco van Basten (1992), Juventus’ Roberto Baggio (1993), Milan’s George Weah (1995), Inter’s Ronaldo (1997), Juventus’ Zinedine Zidane (1998, 2000), Juventus’ Pavel Nedved (2003) and Milan’s Kaka (2007). There were plenty of stars who graced the division before the prize came into existence in the early 1990s, though, including Gigi Riva, Omar Sivori, John Charles, Giampiero Boniperti, Giacinto Facchetti, Giuseppe Bergomi, Silvio Piola, Dino Zoff, Gaetano Scirea, Franco Baresi, Roberto Donadoni, Gunnar Nordahl, Giuseppe Meazza, Diego Maradona, Valentino Mazzola, Marco Tardelli and Michel Platini. In the modern era, Francesco Totti, Javier Zanetti, Zlatan Ibrahimovic, Antonio Di Natale, Alessandro Del Piero, Andrea Pirlo, Andriy Shevchenko, Gabriel Batistuta, Marcel Desailly, Gianluigi Buffon, Paul Pogba, Christian Vieri, Paolo Maldini and Alessandro Nesta have all excelled on the peninsula. Maldini’s 647 outings for Milan make him the all-time highest appearance-maker in Serie A, with Zanetti (615), Totti (606 at the time of writing), Buffon (599 at the time of writing) and Gianluca Pagliuca (592) completing the top five. The record goalscorer is Piola (274), who represented Pro Vercelli, Lazio, Juventus and Novara between 1929 and 1954. Roma’s Totti is next with 250, followed by Nordahl (225), Jose Alfatini and Meazza (both 216) and Di Natale (209). Three players – Giovanni Ferrari (Juventus, Inter and Bologna), Giuseppe Furino (Juventus), Virginio Rosetta (Pro Vercelli and Juventus) – have obtained eight Serie A winner’s medals, which is the most any individual has claimed. Buffon, who is still playing for Juventus, is close behind on seven. The record points tally for a season is Juventus’ 102 in 2013/14, when they won 33 of their 38 matches (including all 19 at home). Inter, with 85, have completed the most seasons in Serie A. They also hold the record for most consecutive victories – 17 in 2006/07. 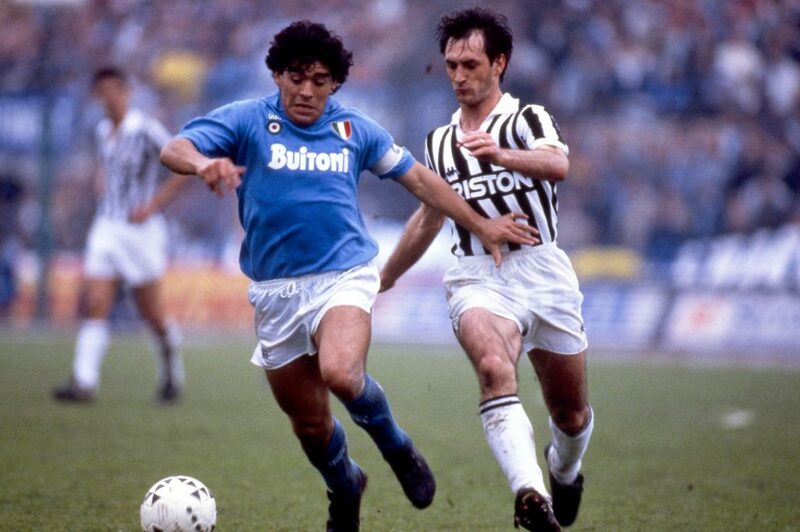 Perugia in 1978/79, Juventus in 2011/12 and Milan in 1991/92 all went through Serie A campaigns unbeaten. Perugia, remarkably, still failed to win the league that year. The longest undefeated run across multiple seasons belongs to Milan, who did not lose a single encounter for 58 consecutive games between May 1991 and March 1993. The oldest person to have played in Serie A is Marco Ballotta, who was 44 years old when he turned out for Lazio in 2008. The youngest is Amedeo Amadei, who was 15 when he made his Roma debut in 1937. Gianluigi Buffon, in many ways, is the foremost goalkeeper to have ever played in Italy’s top division. The Juventus custodian has the longest consecutive run of not conceding (974 minutes in 2015/16), the most clean sheets (273) and the most consecutive clean sheets (10). Gonzalo Higuain scored the most goals in a single season when he found the back of the net 36 times for Napoli in 2015/16. As well as winning the most Serie A titles, Juventus have also won the most matches (1496) and scored the most goals (4804).